Whether you see being unable to work as a stressful experience or a chance to catch up on your Netflix binging, there’s one thing that you can definitely count on: the bills still need to get paid. If you’re like most people, paying usual monthly expenses like rent, grocery or electricity bills might get a bit tricky without your paycheck coming in. And it only gets worse if you’re providing for a family or paying off a home loan. But there’s no need to lie awake at night worrying about it - because that’s where income protection insurance comes in. This one is just what it says on the tin: an income protection policy will replace income lost if you’re sick or injured and unable to work. Once you’ve bought income protection insurance, that policy will usually be in place until you’re 65 years old, as long as you continue working and pay your premiums. Income protection insurance is a pretty important thing for anyone who relies on a pay check to cover their living costs, but it's especially important if you’re self-employed or own a small business, where your employment and income is a bit less stable. What does an income protection insurance policy cover? Generally speaking, the maximum benefit you can claim under your policy is 75% of your gross income from the past 12 months. You might decide this is the right level of cover for you to continue covering living expenses while out of work, or, in some cases, you can opt for a lower benefit when you take out the policy. A fixed term employment contract of 12 months or longer being terminated before the agreed date. The waiting period. 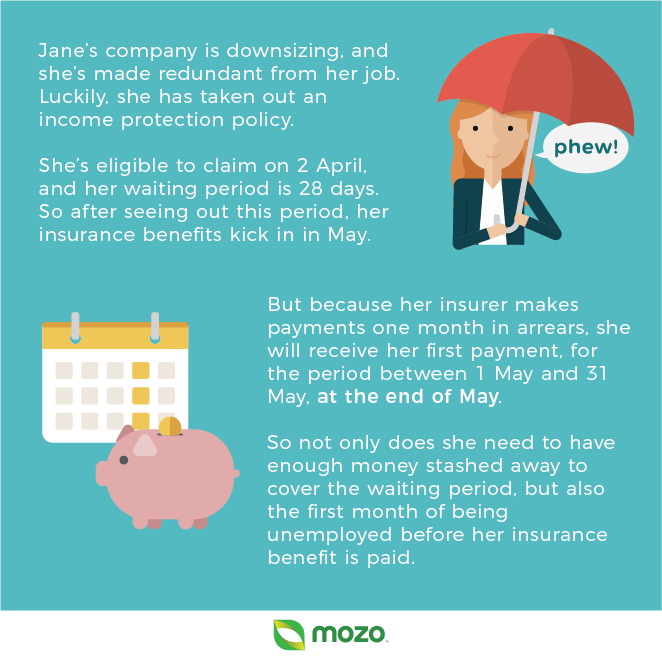 When you buy your policy, you’ll need to nominate a waiting period, which is the length of time between when you become unable to work, to when you are eligible to start receiving payments from your policy. Usually this is 2 weeks to 2 years and a longer waiting period should mean a cheaper policy. When choosing a waiting period, think about how long you could afford to cover living expenses without the payments. If you have a heap of paid leave built up, you may be able to opt for a longer waiting period and save money on your insurance premiums. The benefit period. The benefit period is the maximum amount of time you’ll receive payments under your policy, regardless of how long you’re out of work. This period is decided upfront - sometimes you’ll get to choose, but some insurers have a set benefit period. Usually, benefit periods last either 2 or 5 years, or until the age of 65. Keep in mind that the longer the benefit period, the more expensive your insurance premium will be. Percentage of income insured. Remember when we said that the maximum benefit is usually 75% of your gross income? And remember how we said you can sometimes choose a lower amount? Well, that’s something else you’ll need to think about. The higher the percentage of your income being paid to you, the more expensive your premium will be, so choose carefully. You don’t want to set the cover level too low, or you’ll wind up dipping into your savings despite your income protection insurance, but if you set it higher than necessary, you might be paying high premiums for no reason. So to work out how much of your income you should have insured, you’ll have to take a long, hard look at your budget. You may also want to factor in the potential cost of medical bills, in case you’re unemployed due to sickness or injury. You’ll receive a set monthly payment which is established in your policy when you buy it. 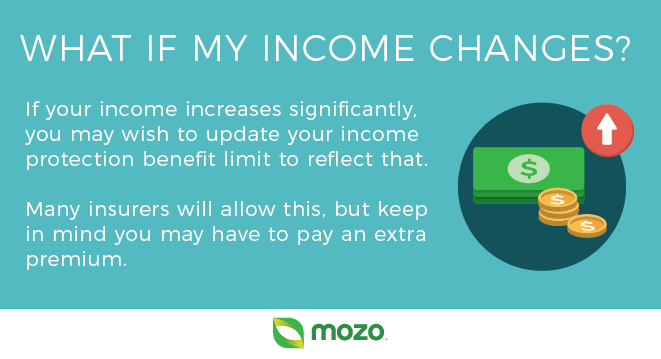 The monthly benefit is assessed based on your income when you make a claim. The main thing to think about when deciding which is right for you is how stable your income is. If it’s very stable and not likely to change, opting for an indemnity policy could save you some money on your premium. On the other hand, if your income tends to fluctuate, an agreed value policy may give you better security. That’s why these policies are often better suited to self-employed people. One more thing you need to consider: stepped premiums vs level premiums. The decision here will likely come down to whether or not you will review your policy and shop around for a better deal in the future. If you like to shop for a better deal: a stepped premium may be better for you. These policies start out cheaper and then get more expensive as time goes on, so when the price starts rising, you can ditch your policy for a better bargain. If you like to set and forget: a level premium might be just the ticket. These premiums will remain the same for the life of your policy, but the price varies depending on your age when you first buy your policy. So if you’re likely to buy your income protection early, then stick with the same policy for the next decade, it will usually be the cheaper option. Ideally, you’ll never have to make a claim on your income protection insurance. But if you do, it’s worth knowing a little about the claims process to keep the stress to a minimum. A certified copy of your I.D, such as a driver's licence or a passport. A completed medical report if you’re claiming due to illness or injury. Evidence of your income, such as an employment contract or a letter from your employer. Evidence of your involuntary redundancy, which might mean a letter from your employer or dismissal notice. Evidence that you’ve been searching for jobs during the waiting period. Any other forms or documentation relevant to your state of employment that might back up your claim. 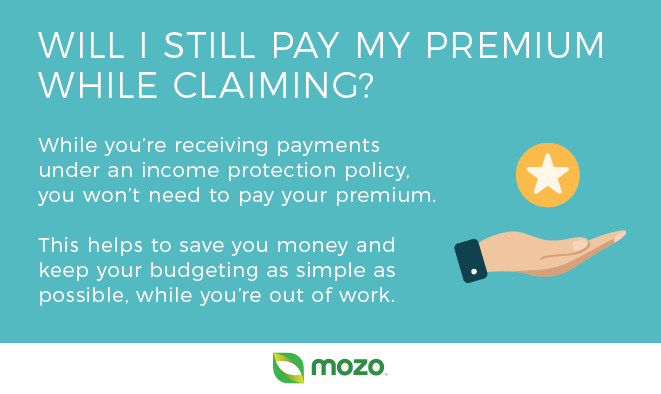 When you make a claim on your income protection policy, there’s a bit of waiting around before you’ll receive any payments. 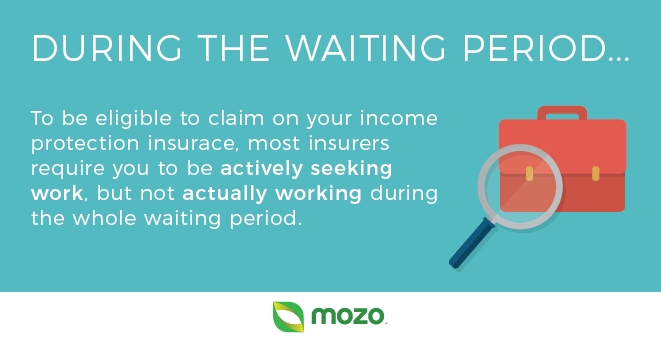 Firstly, you’ll have to clear the waiting period, which you set when you bought your policy. But you may not realise that many insurers make benefit payments one month in arrears. Do I pay tax on income protection payments? Figuring out how tax and your income protection payments work can be tricky. The basic rule is, the premiums on your income protection are tax deductible, but you will need to pay tax on any benefits paid.